It should be emphasized that at this time when Eighth Army was making ready to continue the pursuit north of the Ch'ongch'on River, its logistical situation was not good. The breakdown of rail transportation in October, coincident with Eighth Army's rapid advance northward, caused an extraordinarily heavy burden to fall on truck transport operating over bad roads with long hauls from ports and railheads. At the end of October the 24th Division railhead was still at Yongdungp'o on the south side of the Han River, while the division service elements were in the vicinity of Pakch'on, 205 miles farther north. The longer the trucks ran over the rough Korean roads, the greater grew the number that became inoperable. It was a type of logistical support that promised soon to wear itself to destruction since the spare parts needed for repairs were not available. Morale was high in the U.N. forces as they crossed the Ch'ongch'on and set out on what most of them though would be the last, brief phase of the war. In the 1st Cavalry Division many men thought they would parade on the Plaza in Tokyo wearing yellow cavalry scarves on Thanksgiving Day. The division even started turning in its equipment in expectation of being the first organization to return to Japan. Others throughout the army threw away handbills listing prices of gifts available at post exchanges, saying they were going to do their Christmas shopping in Japan. 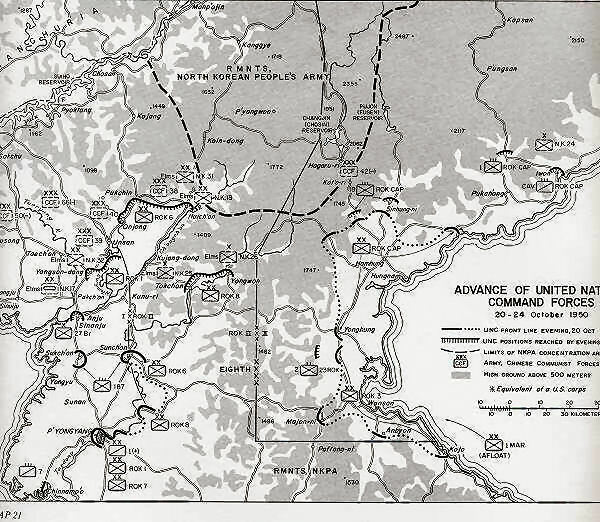 But on 24 October, as the leading U.N. forces crossed the Ch'ongch'on River, General MacArthur issued an order to his ground commanders in Korea which changed all earlier orders drastically. He now removed all restrictions on the use of U.N. ground forces south of the border, and instructed his commanders to press forward to the northern limits of Korea, utilizing all their forces. Thus, when Eighth Army began what it thought would be the last series of maneuvers to end the war it did so under orders radically different from those that had so far guided its operations in Korea. While it is clear that the Joint Chiefs of Staff felt that MacArthur had violated their basic 27 September directive, they did not countermand his orders to go to the Yalu. When the 27th British Commonwealth Brigade crossed the Ch'ong-ch'on, that unit, the U.S. 24th Infantry Division which followed, and all the other U.N. troops deployed in Korea, were authorized to go to the Yalu River-to the extreme northern limits of the country. General Walker on 25 October was quoted as saying, "Everything is going just fine." And so it was-just then. The Ch'ongch'on River and its tributaries, the Kuryong and Taeryong Rivers, all flowing from the north, together form the last major water barrier in the western part of North Korea short of the border. The Ch'ongch'on valley is a wide one for Korea, varying in width from 3 to 20 miles. The Ch'ongch'on, like the Yalu, flows from the northeast to the southwest and it generally parallels the Yalu at a distance of approximately 65 air miles. The Ch'ongch'on River, the principal terrain feature in the field of operations for Eighth Army during late October and November 1950, largely dictated the army's deployment and tactical maneuvers. The main P'yongyang highway crosses the Ch'ongch'on at Sinanju and runs west and northwest in the coastal area to Sinuiju at the North Korean border. Inland from the west coast, mountainous spines run down from the Yalu to the valley of the Ch'ongch'on and the terrain becomes ever rougher and more forbidding. These mountains reach their greatest heights and become almost trackless wastes in central Korea between the Changjin (Chosin) 14 Reservoir and the Yalu. The Yalu itself, save for its lower west coast reaches, runs through a gorgelike channel rimmed by high mountains on both sides. The great Suiho hydroelectric dam on the middle Yalu impounds a reservoir of the same name that extends upstream for sixty air miles, pushing water into hundreds of little lateral fjord-like mountain valleys. Above the reservoir there is a major crossing of the Yalu at Manp'ojin. Twenty air miles southeast of Manp'ojin, situated in the very heart of the mountain fastness, is Kanggye. There the North Korean governmental officials and high military commanders assembled. From there, if necessary, they could retreat across the Yalu at Manp'ojin to the sanctuary of Manchuria. From the valley of the Ch'ongch'on the principal road to Kanggye and Manp'ojin ran northeast from the Sinanju-Aniu-Kunu-ri area through Huich'on. A railroad followed the same passageway. From the lower valley of the Ch'ongch'on, fifty air miles inland from the west coast, an important secondary road network ran north through Unsan to the Yalu. The events of the next few weeks were to give this particular road net special importance. The configuration of the valley of the lower Ch'ongch'on in relation to the mountain ridges that approach it from the Yalu must be noted. North of the lower Ch'ongch'on for a distance of approximately fifteen air miles the ground is flat or only slightly rising with occasional low hills. A lateral road extending eastward from Yongsan-dong and generally paralleling the river marks the cleavage line between this low ground, which in a broad sense can be described as the valley of the Ch'ongch'on, and the mountain spurs that rise rather abruptly from it and extend to the Yalu. The southern extremities of these mountain ranges with their limited corridors of passage form a natural defensive barrier to a military advance northward. The towns of Taech'on, Unsan, and Onjong stand at the entrances to these mountain corridors. There, the logical implications of the terrain were soon to be translated by an enemy into harsh and unwonted military reality. 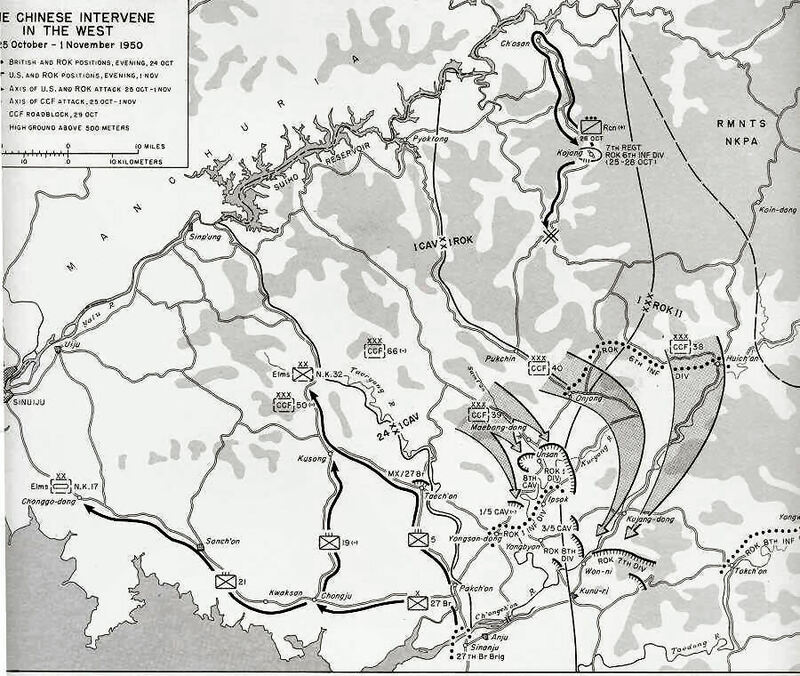 The Eighth Army operation above the Ch'ongch'on began essentially as a continuation of the pursuit that had started with the breakout from the Pusan Perimeter; the U.S. I Corps was on the left, the ROK II Corps on the right. Within Milburn's I Corps, the 24th Division (British 27th Brigade attached) was on the left, the ROK 1st Division on the right. The U.N. Command expected little organized opposition from the enemy and emphasized a speedy advance to the northern border. Several columns were to strike out northward with little or no physical contact between them. The advance was not to be closely co-ordinated; each column was free to advance as fast and as far as possible without respect to gains made by others. As Eighth Army resumed its general advance toward the North Korean border, the ROK 6th Division of the ROK II Corps appeared to have the greatest success of any front-line U.N. division. (Map 22) Meeting virtually no opposition and traveling fast up the valley of the Ch'ongch'on, it reached Huich'on the night of 23 October. There it left the valley of the Ch'ongch'on and turned west, the 7th Regiment leading. Its advanced battalion marched northwest over a cart trail, but the remainder of the regiment had to turn west from Huich'on on a road to Onjong. The night of 24-25 October, the 7th Regiment passed through Onjong, then turned north and joined its advanced battalion. Finding the road clear, it headed north for its objective, the town of Ch'osan, fifty air miles away on the Yalu. Late in the afternoon the regiment stopped at Kojang, a sizable town eighteen air miles south of Ch'osan, and bivouacked there for the night. The next morning, 26 October, Maj. Harry Fleming, KMAG adviser with the ROK 7th Regiment, accompanied the Reconnaissance Platoon, reinforced, into Ch'osan. The remainder of the regiment stayed at its overnight position. In Ch'osan the Reconnaissance Platoon found North Koreans retreating into Manchuria across a narrow floating footbridge that spanned the Yalu. Fleming and the ROK officers directed the setting up of machine guns to halt this foot traffic into Manchuria, but so placed the weapons that the impact area of their fire would not be in China across the river. After a thorough reconnaissance of the town, Fleming and the main body of the Reconnaissance Platoon returned to the regimental position. They left a small party in Ch'osan because the next morning the main force of the ROK 7th Regiment was to come into the town. The Reconnaissance Platoon from the 7th Regiment, ROK 6th Division, was the first U.N. unit to reach the northern border of North Korea, and, as events turned out, it was the only element operating under Eighth Army command ever to get there during the war. Following behind the 6th Division, the ROK 8th Division had reached the valley of the Ch'ongch'on at Kujang-dong the night of 25-26 October, marching from Sunch'on through Tokch'on. On the 29th, the day the advanced elements of the 6th Division reached the Yalu, the 8th turned up the Ch'ongch'on Valley toward Huich'on for the purpose of joining the 6th Division. Meanwhile, back at Onjong the 2d Battalion of the ROK 2d Regiment learned that the 3d Battalion had become heavily engaged, and moved out to support it. On the way, members of the battalion saw enemy troops moving about on the hills to the north. Patrols sent out to investigate came back with a Chinese prisoner. He said that Chinese forces had been waiting in the mountains around Pukchin since 17 October. Another Chinese soldier, badly wounded, was captured on the road ahead. That evening Chinese troops cut off the 2d Battalion from Onjong, but it escaped southward cross-country and succeeded in rejoining the 1st Battalion and regimental headquarters in the town. At 0330 that night, the Chinese attacked Onjong. The ROK troops there broke in panic, but officers succeeded in stopping them at the southeast edge of town. When the Chinese penetrated this position at 0600 the ROK's started withdrawing eastward. They had gone only three miles when they came to a roadblock-the Chinese had cut them off. At this time not a single company of the ROK 2d Regiment was intact. The ROK's now scattered into the hills. Maj. Roy M. Gramling, KMAG adviser to the regiment, and another KMAG officer escaped to Huich'on, but a third, Capt. Paul V. S. Liles, fell captive to the Chinese. That the 2d Regiment apparently did little determined fighting in its first encounter with the Chinese is indicated by the fact that about 2,700 men out of approximately 3,100 in the regiment eventually escaped to the Ch'ongch'on. These startling developments in the Onjong area cut off the 7th Regiment of the ROK 6th Division to the north. At its headquarters at Kojang on the evening of the 26th, the regiment was making plans to occupy Ch'osan on the Yalu in the morning when it received a radio message from the ROK 6th Division. This message said that the 2d Regiment had been defeated and scattered, and ordered it, the 7th Regiment, to start south to rejoin the division. Major Fleming replied by radio that the regiment could not move unless it was resupplied with gasoline, food, and ammunition. An airdrop of supplies was successfully accomplished two days later at 1100. By 31 October Chinese forces were pressing against the ROK II Corps defensive line north and east of Kunu-ri. That morning they broke through the 16th Regiment of the 8th Division, near its boundary with the ROK 1st Division, causing one battalion to scatter. Thus matters stood on 1 November. Within a few days after its first action on 25 October, the CCF had driven back the ROK II Corps, crippling it disastrously, and was south of the Ch'ongch'on on the open right flank of Eighth Army. And disaster was also threatening in the center of the Eighth Army front at Unsan. The 25th of October had been a cold day and carried promise of the bitter North Korean winter that lay ahead. All night the fight above Unsan continued with the sound of small arms and machine guns and the booming of supporting 155-mm. howitzers echoing through the darkness. A small flurry of snow fell early in the morning, the first snow of the winter for these troops. But it was a minor worry compared to the startling fact that during the night enemy forces had nearly surrounded Unsan. Morning brought more information that the forces were Chinese. One report told of thirty-three Chinese dead found north of the town. On the 27th the situation at Unsan improved somewhat. 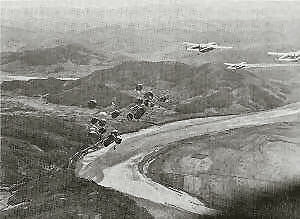 An airdrop shortly after 1100 by ten C-119 planes flying from Ashiya Air Base eased the critical supply situation within the ROK 1st Division, the two supporting tank companies of the 6th Tank Battalion, and the 10th AAA Group. Freshly supplied with ammunition, the ROK 15th and 12th Regiments attacked and made slight gains north and west of the town. To the south of the town two battalions of the 11th Regiment cleared the road, and in the late afternoon reported the enemy there had withdrawn to the northwest. In these attacks the ROK's found the Chinese well dug-in, exceptionally well camouflaged, and very hard to locate. SUPPLY BY AIR to the ROK 1st Division in the Unsan area. On the 28th the fighting at Unsan quieted down, although the ROK's captured two more Chinese prisoners. They repeated the same story told by previousprisoners-that they were members of large Chinese organizations that had entered the war. General Walker and the Eighth Army staff at P'yongyang had, of course, followed closely the many reports that came in concerning the puzzling and disturbing news from north of the Ch'ongch'on, particularly the information given by the first prisoners alleged by the ROK's to be Chinese. But, as would be natural in such a newly developing situation, the intelligence officials did not accept at face value all the information the prisoners related about the Chinese troop organizations they said were in Korea. As the extent of reverses north of the Ch'ongch'on mounted quickly within a day or two, General Walker and his staff, however, were forced to question the correctness of their initial reaction that the Chinese troops there represented only reinforcement of North Korean units. The ROK attack that began at first light on the morning of 29 October quickly developed into a stubborn fight against dug-in enemy using mortars, automatic weapons, and small arms. Even with the help of the artillery barrages and Fifth Air Force strafing attacks, the ROK's could not dislodge the Chinese. Because Chinese forces had engulfed the ROK II Corps to the east in the Onjong and Huich'on areas, the ROK 1st Division now constituted a northern salient in the U.N. line. On its left there was a gap of fifteen air miles between it and elements of the U.S. 24th Division, the nearest Eighth Army unit on the west. On 31 October, the 2d and 3d Battalions, 8th Cavalry, relieved the ROK 12th Regiment. But on the right an enemy attack during the night had driven back the ROK 2d Battalion more than a mile. Its commander wanted his troops to regain the lost ground before they were relieved. Millikin's 1st Battalion, however, moved into a defensive position behind this part of the ROK line north of Unsan. That afternoon, General Milburn, U.S. I Corps commander, visited the 8th Cavalry regimental command post and was told everything was all right. On the morning of 1 November the ROK's tried to regain their lost ground. Though assisted by elements of the 6th Tank Battalion they made only a slight gain. In this situation, elements of B Company of Millikin's battalion and an attached platoon of tanks from B Company, 70th Tank Battalion, attacked north along the west bank of the Samt'an River. In this fight tank fire greatly assisted the ROK's, but three of the tanks were damaged. By noon the 2d Battalion of the ROK 12th Regiment had regained something more than half a mile of ground. But it seemed that it would make no further gain as heavy enemy 120-mm. mortar fire started falling, forcing the tanks to withdraw. Eastward across the river, at a distance of about two miles, the ROK 15th Regiment could be seen under very heavy attack. The arrival of the U.S. 8th Cavalry Regiment at Unsan had set in motion a redeployment of the ROK 1st Division. Upon being relieved west of Unsan on 31 October, the ROK 11th Regiment had shifted southeast to establish contact with the ROK 8th Division on the corps boundary. The ROK 12th Regiment moved to a rest and reserve assembly area at Ipsok south of the Kuryong River, six air miles from Unsan. Still engaged in the battle at Unsan, the ROK 15th Regiment was desperately trying to hold its position across the Samt'an River east of the 8th Cavalry Regiment. In short, the U.S. 8th Cavalry Regiment was to the north, west, and south of Unsan; the ROK 1st Division to the northeast, east, and southeast of it. Johnson turned back, passed through the picturesque walled city of Yongbyon, and that evening, shortly after dark, arrived at his command post at Yongsan-dong. There he learned that the 1st Battalion patrol in the early afternoon had found Chinese soldiers astride the road opposite the Turtle Head Bend of the Kuryong River, four air miles south of the 3d Battalion, 8th Cavalry, positions. During the afternoon two companies of the 1st Battalion had moved to the scene and were now engaged in battle there with a large enemy force. The next morning, 29 October, the Australian 3d Battalion attacked toward Ch'ongju. Aerial observers reported at least four enemy tanks with infantry on the ridge overlooking the road at the pass. In strikes against these positions with napalm and rockets, the Air Force destroyed four tanks. The Australian attack then gained the pass and the adjacent ridge lines. That evening the North Koreans attacked the Australians there in the two hours preceding midnight, employing self-propelled gun and tank support. Australian bazooka teams destroyed three enemy T34's. Supporting American tank fire helped repel the attack. The Australians lost nine killed and thirty wounded in the battle before Ch'ongju. The next morning the Argylls entered Ch'ongju. That evening, 30 October, North Korean high velocity shells landed in the vicinity of the town, six of them in the headquarters area of the Australian 3d Battalion. One of the six shells cleared a crest, hit a tree, and exploded outside Colonel Green's tent. Colonel Green was asleep inside on a stretcher. Strangely enough, although there were numerous soldiers in the area at the time, no one was injured except Colonel Green, who was struck in the stomach by a shell fragment. The seriously wounded officer was taken to the surgical hospital at Anju. There three days later the much admired Lt. Col. Charles H. Green, the Australian 3d Battalion commander, died. Lt. Col. I. B. Ferguson succeeded him in command of the battalion. The same night that North Korean fire struck down Colonel Green, similar artillery or tank fire killed Major Reith of the 27th Brigade. Brigadier Coad on the 30th asked General Church, commanding the 24th Division, to pass a regiment through his British troops at Ch'ongju because they were very tired. Acceding at once, Church ordered the 21st Infantry Regiment to lead the advance. After this night of battle, the regiment encountered only light resistance. Its advanced troops, Lt. Col. Charles B. Smith's 1st Battalion, by noon of 1 November reached the outskirts of Chonggo-dong, eighteen air miles from Sinuiju and the Yalu River. This was the northernmost action fought by a unit of the United States Eighth Army in the Korean War. By a strange coincidence, the infantry element engaged was Colonel Smith's 1st Battalion, 21st Infantry, part of which had fought the first American ground battle near Osan nearly four months earlier. In a geographical sense at least, the action near Chonggo-dong on the afternoon of 1 November was the high-water mark of Eighth Army's effort to reach the Manchurian border and consolidate all of Korea for a unified government. The uncertainty of the 21st and 5th Regiments during the afternoon and evening of 1 November over their future courses of action was resolved an hour before midnight when the 24th Division ordered them to withdraw toward the Ch'ongchon. Mystified and disappointed, the men of the two regimental combat teams traveled back toward the Ch'ongch'on the night of 1-2 November. They were to learn later that the explanation for this, to them, puzzling development lay in events that had taken place in the east. The day before, 31 October, General Walker verbally had ordered General Milburn to limit the 24th Division attack in keeping with the situation in the Unsan area. There lay the controlling events. The troops which General Almond found in his corps area on 20 October consisted of his own small command group of approximately 10 officers and 30 men, ROK I Corps troops numbering more than 23,000 men, and the few hundred troops of the 1st Marine Air Wing already at the airfield. His own X Corps troops still afloat would bring the total to nearly 84,000 men. In addition, there was the U.S. 3d Division which he expected would soon join the corps. Of the approximately 84,000 men then in the corps, more than a third-32,000-were South Korean soldiers. The major tactical organizations were the U.S. 1st Marine and 7th Infantry Divisions, and the 31 and Capital Divisions of ROK I Corps. The only known organized enemy groups in the X Corps area at this time were north and northeast of Hungnam. Rough terrain characterized the area in northeast Korea assigned to the X Corps. (Map 21.) Even the coastal plain hardly deserved that name; the only level or semi-level land there consisted of isolated pockets extending inland generally for a distance of from three to five miles. These were separated from each other by hill spurs that came down to the sea. The Wonsan-Hamhung pocket is by far the largest of these northeast coast semi-level areas. Wonsan and Hamhung, and the latter's port of Hungnam, were the largest centers of population in the X Corps zone of operation. Wonsan in 1949 had a population of 150,000, but it had fallen to an estimated 90,000 in October 1950. Hamhung's population in October 1950 was placed at 80,000, at least 40 percent of it Communist or Communist-inclined. Chemical, dye, medical, gunpowder, and fertilizer plants in the Hungnam-Hamhung area made it the outstanding industrial area of Korea. At the ports of Wonsan and Hungnam ice is unusual, and when it occurs it is so thin as to be unimportant. The principal road north from the Wonsan-Hamhung plain climbs the Taebaek Range to the Kot'o-ri plateau and then continues on to Hagaru-ri at the southern end of the Changjin Reservoir. From the Hamhung area a second important road, the east coast road, curves northeast toward the border of the Soviet Union. Inland from this coastal road the communication routes were poor-in places scarcely more than mountain trails. Acting upon its orders, the ROK I Corps had attacked north from the Hamhung area-the 3d Division north toward the Changjin Reservoir and the Capital Division northeast up the coastal road. The 26th Regiment led the advance for the ROK 3d Division. On the morning of 25 October two battalions of the regiment approached the first and second hydroelectric plants of the Changjin Reservoir area, about thirty road miles inland from Hungnam, and halfway to the reservoir itself. A message from Maj. Malcolm Smith, KMAG adviser with the regiment, to Colonel Emmerich that evening informed him that the regiment had captured a prisoner definitely identified as a Chinese soldier who said he belonged to the 5th Regiment of the Chinese 8th Army. This prisoner said there were 4,000 to 5,000 Chinese in the immediate vicinity. During the next two days the ROK regiment moved ahead very slowly against increasing resistance. On the morning of 28 October the ROK's attacked in the vicinity of Sudong in what proved to be a very costly action, and suffered heavy casualties. ROK patrols to the Sinhung-ni and Koto-ri areas brought back news that they had seen at both places what they believed to be Chinese soldiers. That day two Chinese soldiers were captured one mile west of Sudong. North Koreans as well as the newly arrived CCF fought in the Sudong area. On the 29th, for instance, in addition to the sixteen Chinese, the ROK 26th Regiment captured sixty North Korean prisoners. There, as in front of Eighth Army at the same time, the North Koreans fought delaying actions while they backed up to a point where they met the approaching Chinese or the latter lay in wait. It was perhaps a coincidence that the Chinese entered action on both fronts, first against ROK troops as it chanced, at almost the same moment. In both east and west that fateful day was 25 October. EUSAK WD, G-1 Daily Hist Rpt, 26 Oct 50; Ibid., POR 389, 19 Nov 50; Ibid., Br. for CG, 9 Nov 50: GHQ UNC, G-3 Rpts, 27 and 30 Oct 50; 25th Div WD, 30 Oct 50. Maj William F. Fox, History of the Korean War, Inter-Allied Co- operation During Combat Operations, vol. III, pt. 2, sec. B, pp. 10-11, MS in OCMH: Ltr Ord, Hq, EUSAK to CG, 2d Log Comd, 8 Oct 50, sub: Establishment of UNRC. Log Comd Monthly Act Rpt, G-3 and G-4 Secs, Oct and Nov 50. Interv, author with Maj Gen Leven C. Allen, 15 Dec 53: EUSAK WD, Trans Sec, 18 Nov and G-4 Jnl, Msg 9, 241430 Nov 50: 24th Div WD, G-4 Daily Summ, 29-30 Oct 50: 2d Div WD, Narr Summ, Nov 50, p. 11. EUSAK WD, Ord Daily Act Rpts, 27, 28, 31 Oct and 6 Nov 50: Ibid., Trans Sec, 25 Oct 50: 3d Log Comd Act Rpt. Nov 50, p. 8. Schnabel, FEC, GHQ Support and Participation in the Korean War, ch. VII, pp. 3-5, citing Msg 94651, JCS to CINCFE, 21 Oct 50, Msg C67065, CINCFE to DA for JCS, 21 Oct 50, and Msg S94985, DA to CINCFE, 25 Oct 50. Ibid., ch. VII, pp. 6-7, citing Msg CX67506, CINCFE to CG Eighth Army and CG JLC, 26 Oct 50, and Msg CX8002, CINCFE to DA, 28 Oct 50. New York Times, October 29, 1950. EUSAK WD, G-3 Sec, 30 Oct 50: Ibid., G-1 Sec, Civil Assistance Stf Sec Rpt, 1 Nov 50. Schnabel, FEC, GHQ Support and Participation in the Korean War, ch. VI, pp. 31-32, citing Msg CX66705, CINCUNC to all comdrs, 17 Oct 50, and CX66839, CINCUNC to all comdrs, 19 Oct 50. Ibid., p. 34, citing Msg CX67291, CINCUNC to all comdrs, 24 Oct 50. C67397, CINCFE to JCS, 25 Oct 50; Senate MacArthur Hearings, MacArthur's testimony, pp. 97-98; Gen. of the Army Omar N. Bradley's testimony, pt. I, p. 757, and Gen Collins' testimony, pt. 2, pp. 1216-17, 1229-30, 3235, 1239-41, 1312-13. EUSAK WD, Daily News Bul, 25 Oct 50. See p. 729, n. 1, below. Interv, author with Gramling, 17 Feb 54; Ltrs, Fleming to author, 9 and 18 Mar 54: EUSAK WD, G-3 Jnl, 23-24 Oct 50. This account of the ROK's at Ch'osan is based largely on Ltrs, Fleming to author 9 and 18 Mar 54: also Interv author with Lt Col Willard G. Pearson, 1 Aug 51; EUSAK POR 319, 26 Oct 50: EUSAK WD, Br for CG, 26 Oct 50. Interv author with Gramling, 17 Feb 54; EUSAK POR 319, 26 Oct 50. Unless otherwise noted the Onjong narrative is based on the authors interview with Gramling. Army records have only a few fragmentary references to the ROK II corps action at Onjong. Interv, author with Gramling, 17 Feb 54; EUSAK WD, 28 Oct 50, Memo to CofS, G-2, et al., from Acting CofS, G-3 (Rpt of Lt Col F. J. Lagasse after visiting Hq ROK II Corps); Ibid., 29 Oct 50. Ltrs, Fleming to author, 9 and 18 Mar 54; EUSAK WD, Br for CG, 28 Oct 50; Lagasse Rpt, cited n. 17. Ltrs, Fleming to author. 9 and 18 Mar 54; EUSAK WD. G-3 Jnl, Msg 0130 30 Oct 50; Interv, author with Gramling, 17 Feb 54; ATIS Enemy Documents, Korean Operations, Issue 42 (11 Jun 51), item 52, opposite p. 162. Interv, author with Lt Col Thomas E. Bennett (KMAG adviser to ROK 7th Regt in early Nov 50), 11 Dec 53: Paik Sun Yup, MS review comments, 11 Jul 58. EUSAK WD, G-3 Sec, 29 Oct 50; US I Corps WD, Oct 50, p. 45. EUSAK PIR 111, 31 Oct 50; EUSAK WD, G-3 Sec, 31 Oct and 1 Nov 50. I Corps WD, 25 Oct 50; I Corps Intel Summ 122, 25 Oct 50; I Corps PIR 40, 25 Oct 50: 6th Med Tk Bn WD, 25 Oct 50. 6th Med Tk Bn WD, 25 Oct 50: EUSAK WD, G-3 Jnl, Msg at 1715 25 Oct 50: Ltr, Col Percy W. Thompson (G-2, I Corps Oct 50) to author, 9 Apr 54; Collier, MS review comments, 10 Mar 58. EUSAK POR 316, 25 Oct 50. I Corps Opn Dir 14, 251600 Oct 50. 10th AAA WD, 25-31 Oct 50; U.S. units supporting the ROK 1st Division at this time were the 17th Field Artillery Battalion (105-mm. ), 10th Antiaircraft Artillery Group (included 155-mm. howitzers and 90-mm. guns), and two companies of the 6th Medium Tank Battalion. EUSAK WD, Br for CG, 26-27 Oct 50; EUSAK PIR 106, 26 Oct 50; EUSAK WD, G-3 Jnl, Msgs at 1340, 1530, 1700, and 2115, 26 Oct, and Jnl, 27 Oct 50; I Corps WD, 26 Oct 50; 6th Med Tk Bn WD, 26 27 Oct 50; Arty Rpt 12, 27 Oct 50. I Corps Opn Dir 15, 26 Oct 50; EUSAK PIR 6, 26 Oct 50. Interv, author with Col William H. Hennig (CO, 10th AAA Croup, Oct 50), 23 Mar 54 Interv, author with Milburn, 4 Jan 52; I Corps WD, 27 Oct 50: New York Times, October 27, 1950. I Corps WD, 28 Oct 50; EUSAK POR 325, 28 Oct 50; Ltr, Gay to author, 19 Feb 54. Ltr, Gay to author, 19 Feb 54; Ltr, Millikin (CO, 1st Bn, 8th Cav Regt, Oct 50) to author, 6 May 54; I Corps WD, 29-30 Oct 50: EUSAK WD, Br for CG, 29 Oct 50; EUSAK WD, G-3 Sec, 30 Oct 50: 6th Med Tk Bn WD, 30 Oct 50; 8th Cav Regt Unit Jnl, entry at 301915 Oct 50. Ltr, Millikin to author, 6 May 54; Interv, author with Hennig, 23 Mar 54; 70th Tk Bn WD, 1 Nov 50, Msg file, 1210, 1435; 8th Cav Regt Jnl file, 31 Oct-1 Nov 50, and 8th Cav POR 181, Msgs 311730, 011413, 011645, 31 Oct-1 Nov 50. Ltr, Millikin to author, 6 May 54 and attached sketch map; Ltr, Lt Col William Walton (CO, 2d Bn, 8th Cav, Nov 50) to author, 27 Aug 54 and attached sketch map; I Corps POR's 150 and 151, 1 Nov 50; 8th Cav Regt Unit Jnl, 011430 Nov 50. Interv, author with Col Harold K. Johnson, 28 Apr 54; Johnson, MS review comments, recd Aug 54. Ibid. ; Ltr, Millikin to author, 6 May 54. 27th British Commonwealth Brig Sitrep, 24-28 Oct 50; 24th Div WD, 26-28 Oct 50: EUSAK POR 316, 25 Oct 50; Bartlett With the Australians in Korea, pp. 32-34. Interv, author with Col Gines Perez, 6 Aug 51; Interv, author with Maj Charles R. Alkire (S-2, 21st Inf Regt), 6 Aug 51; 24th Div WD, 29-31 Oct 50; 21st Inf Unit Rpt 115, 31 Oct 50. Eighth Army General Order 244, 26 April 1951, awarded the Distinguished Service Cross to Colonel Perez. 21st Inf WD, 1 Nov 50; EUSAK WD, G-3 Sec, 1 Nov 50; 24th Div WD, 1 Nov 50. 21st Inf Unit Rpt 116, 31 Oct-1 Nov 50: Interv, author with Lt Col Charles B. Smith, 6 Nov 51; Armor (May-June, 1951), article by 1st Lt. Robert D. Wilcox (tk plat ldr in the action), p. 28. Interv, author with Col John L. Throckmorton, 16 Apr 54; Ltr, Thompson to author, 9 Apr 54. 24th Div WD, 30 Oct-2 Nov 50: EUSAK WD, Br for CG, 30 Oct 50: Interv, author with Maj Gen Garrison H. Davidson, 28 Jan 54. 24th Div WD, 1-2 Nov 50; 21st Inf Unit Jnl, Msg 31, 012211 and Msg 35, 012300 Nov 50; EUSAK WD, G-3 Sec, 31 Oct 50. X Corps WD, Oct 50 Summ, p. 3; Ibid., Opns, p. 19, citing CINCUNC Msg CX66705, 17 Oct 50, and CINCUNC Msg CX66739, 19 Oct 50; Ibid., Diary, CG X Corps, 16 and 18 Oct 50. X Corps WD, Summ and Diary, CG X Corps, 20 Oct 50: Ibid., Oct 50 Summ, Sig Sec, pp. 29-30. X Corps WD, 4 Nov 50, G-1 Rpt, Notes on Conference between CG X Corps and Partridge, 4 Nov 50; X Corps WD, 26 Oct 50; Ibid., Catalogue of Plans and Orders, p. 50, Opn Instr 13, 261000 Oct 50. The corps boundary was changed slightly on 28 October to run from the Sea of Japan at the 38th Parallel to longitude 128° east, thence northwest to Poftong-ni, longitude 127° 5' east, latitude 38° 58' north, thence north to the 38th Parallel, thence west on that parallel to longitude 126° 45' east. See EUSAK WD, G-3 Sec, 28 Oct 50. X Corps WD, Oct 50, Opns, p. 20; 1st Mar Div SAR, 8 Oct-13 Dec 50, an. C, pp. 9-10. X Corps WD, Oct 50, p. 15; X Corps PIR 33, 29 Oct, and 35, 31 Oct 50; Emmerich, MS review comments, 30 Nov 57. X Corps WD, Diary, CG X Corps, 30 Oct 50; Ibid., G-1 Rpt, Notes on Conference between CG X Corps and Partridge, 4 Nov 50: X Corps PIR 34, 30 Oct 50; Interv, author with Almond, 1 Dec 5; Ltr, McCaffrey to Almond, 1 Dec 54, forwarded to author. X Corps WD, Diary, CC X Corps, 31 Oct 50; Ibid., PIR 36, 1 Nov 50: ATIS Interrog Rpts (N.K. Forces), Issue 18, 2324, p. 57. X Corps PIR 43, 8 Nov and 46, an. 2, 11 Nov 50; 1st Mar Div SAR, vol. I, pp. 15, 19, 20, 30, an. B, 6-8 Nov 50; SSgt Robert W. Tallent, "New Enemy," Leatherneck, vol. XXXIV, No. 2 (February 22, 1951), pp. 12-14.